Posted on March 7, 2018. 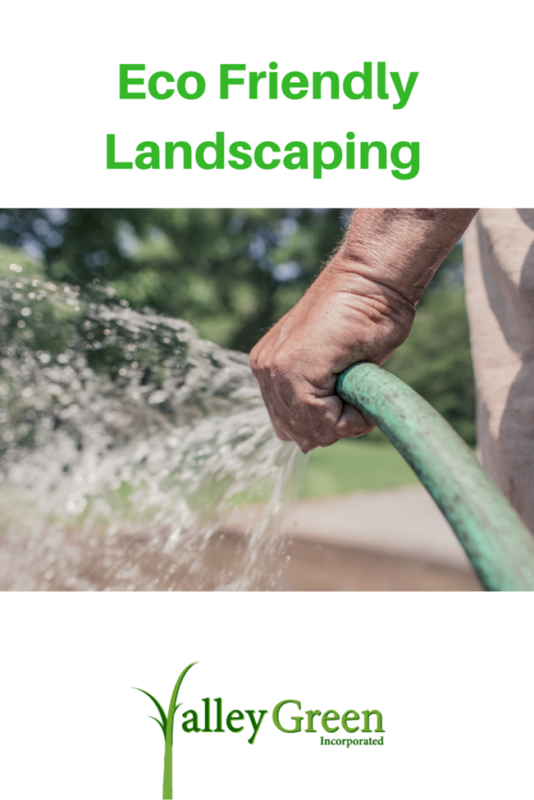 Landscaping is one of the United States most popular growing industries. Because of client demand, many landscaping companies are turning to organic and earth-friendly landscaping products. In this article, Valley Green will offer you and your company a way to devise an eco friendly landscaping plan. Reuse Material: Take a look around your fleet location for materials you can reuse or recycle to reduce waste and save money in the process. Plant shrubs or bushes around the client’s home that act as a natural wind barrier and insulator; this will keep your client and family naturally comfortable year round using less air conditioning and heating. Landscaping efficiently means both keeping plants at their best while conserving water. Encourage clients to consider drip irrigation which is shown to be 90% -95% effective in delivering water ( as opposed to 70% for sprinklers). Mulch landscape plants. Mulch helps keep soil cool and retain water. It also encourages worms, microbes and the other organisms that keep soil healthy. As it decays, it adds organic material back to the earth. Aerate the lawn to avoid soil compaction. Compacted soil encourages thatch to build and water to runoff. Aerating is a form of root prune that stimulates strong growth. Make sure sprinklers are set for maximum efficiency. This includes proper settings for early or late waterings (even overnight) that are set to proper amounts. Make sure sprinklers heads are set to efficiently cover lawns without wasting water on sidewalks and driveways. Valley Green was founded by Charles Dooley in 1990. Headquartered in Holyoke, Massachusetts, we have grown to seven branch locations supported by inside & outside sales associates specializing in turf seed, sod production, golf sales, turf maintenance, nursery production, agriculture and arboriculture. The average green industry tenure at Valley Green is well over 20 years per associate! Return to the full list of News & Promotions.